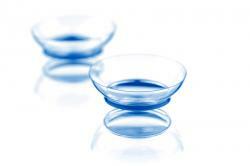 What are the advantages to wearing contact lenses? Many of our patients who opt for contact lenses do so because they don’t like the feel or appearance of their glasses and prefer how their eyes look without contacts. Contacts may also offer better vision correction due to the reduced obstruction from eyeglass frames. Glasses can fog up in warm rooms or during rain showers, become scratched or dirty, or get in the way when playing sports or participating in other recreational activities. Contacts also provide excellent peripheral vision. What are disadvantages to wearing contacts? Contact lenses require getting used to. New soft lens wearers typically adjust to their lenses within a week. Rigid lenses generally require a somewhat longer adjustment period. Except for some disposable varieties, almost all lenses require regular cleaning and disinfection, a process that, although requiring only a few minutes, is more than some people want to undertake. Finally, some types of lenses may increase your eyes' sensitivity to light. Can anyone not wear contacts? Wearing contacts may be difficult if any of the following apply: your eyes are severely irritated by allergies; you work in an environment with lots of dust and chemicals; you have an overactive thyroid, uncontrolled diabetes, or severe arthritis in your hands; or your eyes are overly dry due to pregnancy or medications you are taking. If any of these conditions apply, talk to our optometrist in Maple Ridge about your different options. How do I determine which contacts are right for me? Our eye doctor can help you decide which contacts are right for your vision and health needs. For example, if your eyes are “hard to fit” because of astigmatism, dry eyes, presbyopia, or another condition, you may not be a good candidate for soft contacts. This does not mean, however, that you cannot still wear contacts. Gas permeable contact lenses are made of a rigid oxygen-permeable material so they retain their shape when placed in your eye and do not conform to the shape of your cornea. For this reason, our optometrist in Maple Ridge may prescribe gas permeable contact lenses for presbyopia patients. Toric contact lenses are specially designed to correct astigmatism; these designs are available in both soft and rigid gas permeable lenses. Do I need to wear contacts every day? If you are nearsighted, farsighted, or have been diagnosed with astigmatism or another condition that affects your quality of vision, you will need to wear either contacts or glasses on a daily basis. Some patients prefer to primarily wear glasses and save contacts for special occasions. For example, if you like how you look in glasses or generally feel more comfortable wearing glasses, you can still wear contacts for special occasions, while participating in a sports match, or even to match your fashions. Single-use, one-day disposable contacts are comfortable to wear and can be easily interchanged with your glasses. For more information on selecting the right contact lenses for your vision and lifestyle needs, schedule an appointment with our optometrist in Maple Ridge. Call 604-463-4469 today or book online!